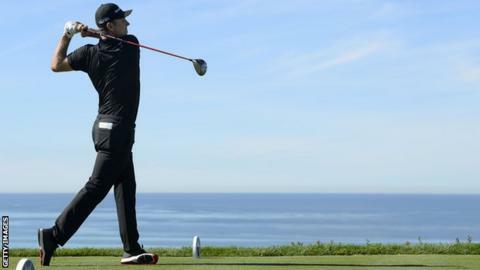 World number one Justin Rose opened up a three-shot lead after the second round of the Farmers Insurance Open. The Englishman, playing on the South Course at Torrey Pines in California, hit a six-under-par 66 to overtake Jon Rahm at the top of the leaderboard. Japan's Hideki Matsuyama sits in second place while Rahm's disappointing 72 meant the Spaniard dropped to joint third. Northern Ireland's Rory McIlroy moved into contention with a seven-under-par 65 on the North Course. However, McIlroy is still seven shots adrift of Rose. Tiger Woods, also playing the North Course and returning to the scene of his last major win in 2008, shot a second two-under-par 70. Rose hit seven birdies to add to his opening round 63 and meant he equalled the 36-hole tournament record. "The job was done today," said Rose. "It's really nice to go out there and place a positive round and feel good on it. I can build on it hopefully on the weekend." Like McIlroy, Scotland's Martin Laird also soared up the leaderboard with an impressive round. His six-under 66 lifted the Scot 81 places - though he is still 10 shots behind leader Rose - where he is level with England's Danny Willett. Compatriot Russell Knox went round in 70 following an opening-68, leaving him seven under par overall.